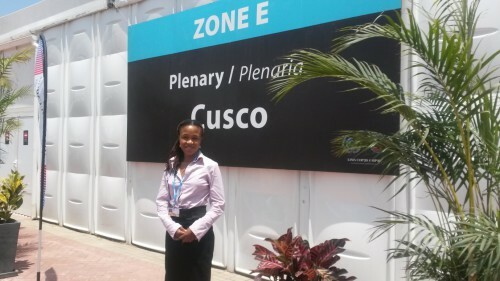 SAFCEI Regional Coordinator Lydia Mogano sends us some quick impressions directly from Lima where she is attending the COP20 climate talks. 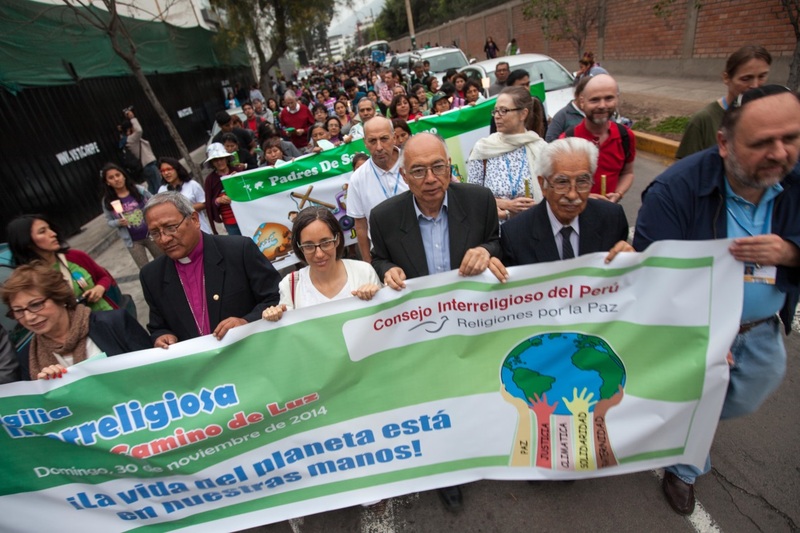 At the opening of the international climate talks (COP20) in Lima, a new COP president from Peru took office. He highlighted that COP 20 was a space for dialogue, innovation and commitment to action. It is space to foster alliances for climate, development and action. Civil society’s participation is a high priority and will have the voice of the people heard. “Youth and women rights will not be put last but at the beginning of this session” said the new COP President. This is a COP for transformation and an opportunity to make climate history. Yet again, the green candle received from the interfaith group was clearly acknowledged to guide the process and illuminate the solutions and decisions! 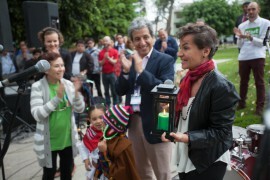 All speakers, including the Mayor of Lima, said all the right things one would expect to hear at a conference opening. The Chair of the Subsidiary Body for Scientific and Technological Advice (SBSTA) of the UNFCC, shared the scientific facts, reflecting on key messages from the latest Climate Change Assessment Report (AR5). A strong emphasis was placed on the fact that the human influence on climate change is now clear! Furthermore, temperatures continues to rise. What is new in the report is that the oceans absorbed most of the heat. There is a rise in sea level from 0.2 to 0.5% and an increase in GHG emissions by 2.2% per year. He warned that the longer we delayed action, the more expensive and difficult it will be to resolve the climate crisis! The window for climate action really is rapidly closing (65% of the carbon budget is used up). He then called for an ethical, equitable and implementable agreement. “The choice is ours,” he said. I hope to see all those beautiful words translate into action at the actual negotiations! 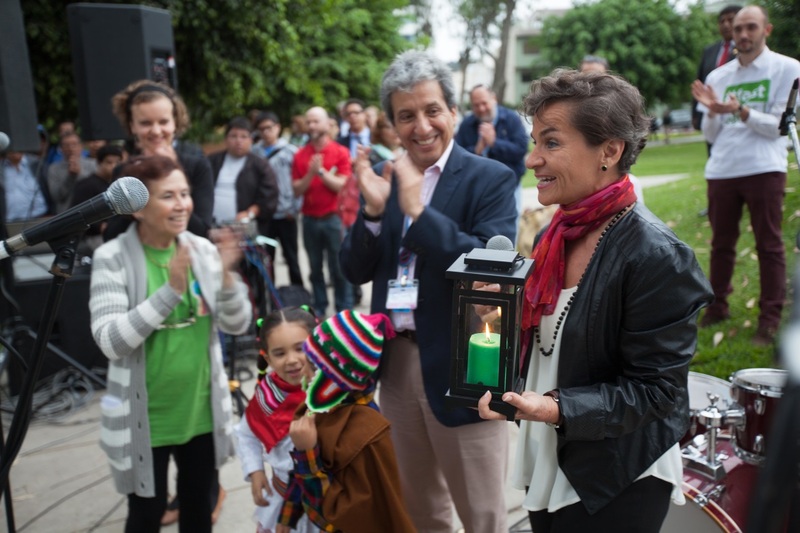 There will be a Lima climate action day on the 11th December 2014. The climate fast stunt (where participants sat at a table with empty plates) successfully drew media attention. Participants shared with bystanders why they are fasting and this was followed by a press conference. 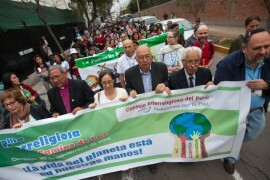 There are a few climate change deniers here in Lima who try to cover this event as a purely social one. They insist that climate change is not real. Moreover, although science is clear about the human impact on the climate, many people find it hard to relate to the scientific evidence and reality of our current circumstances. In response I shared a tweet on Twitter about connecting the reality on the ground with science. I want people to taste and experience climate variability and imagine how unpleasant life will become on Earth if temperatures continue to rise. I saw a few people and organizations retweeting my messages which was really encouraging! When it was time for coffee, congregants walked into the church hall which was filled with artwork by the children which have been working with the new Ryan the Rhino Sunday School resource. The Sunday School program focuses on the Story of Creation, relating it to our care for God’s creation. 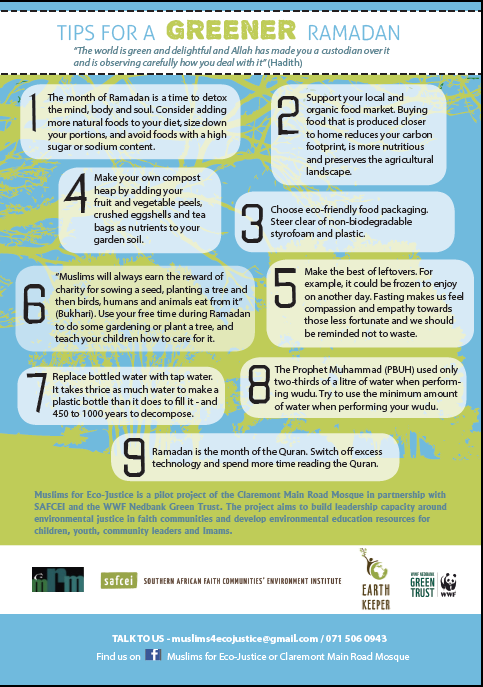 This is a new resource which is being piloted by the Green Anglicans in collaboration with SAFCEI and funded by WWF Nedbank Green Trust. 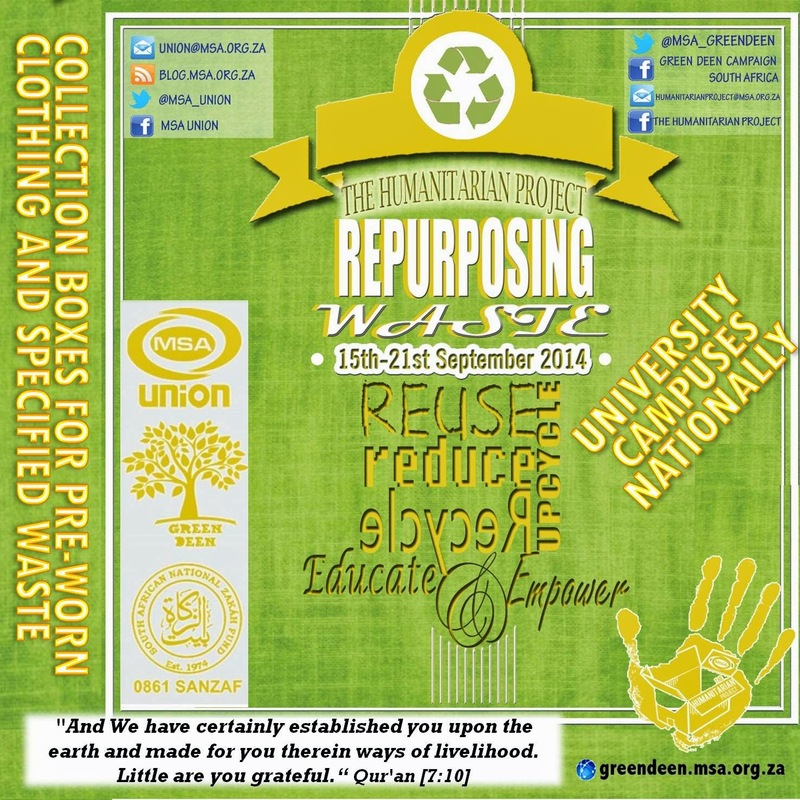 The Union of Muslim Students’ Association (MSA Union of South Africa) and it’s initiative Green Deen South Africa, in conjunction with SANZAF, takes great pleasure in announcing the National Flagship Project for 2014 – The Humanitarian Project: Repurposing Waste. We aim to create mass student involvement and raise awareness on our campuses. Items that will be collected are: second hand clothing, electronic waste and upcycling material. 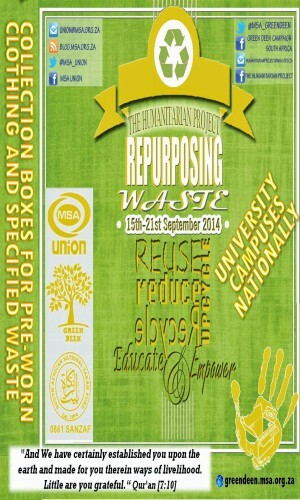 Collection boxes will be placed at campuses around the country. The recipients of the second hand clothing will be people identified by SANZAF, who will also liaise with the recognised recipients. 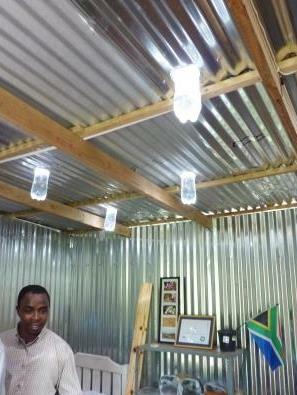 The recipients will receive training and support by SANZAF, which will ensure continuity and success of the project. Additionally campuses can choose to raise awareness by upcycling waste into cool novelties on campuses, collecting electronic waste for recycling and raising awareness on the importance of repurposing waste. ‘n Kerk basaar met ‘n groen krul? Eko-ekspo’s of Eco-kermisse is ‘n nuwe manier waarop kerke gemeenskappe bewus maak van verskillende ekologiese kwessies , asook die wye verskeidenheid maniere waarop mens vandag ‘n eko-vriendelike leefstyl kan handhaaf. Alhoewel gelowiges bewus is van hulle verantwoordelikheid om na die aarde om te sien, verksyn daar steeds vraagtekens as dit kom oor hoe ons ons verbintenis tot aardesorg prakties kan uitleef. Daarom dat volhoubare, groen besighede hulle produkte by hierdie kermisse kom bekendstel – vanaf sonpanele en watertenks, tot by eko-vriendelike kosmetiese produkte en skoonmaakmiddels. As daar een ding is wat ons groenes goed ken, is dit herwinning. Maar wie sou kon dink dat mens klimrame, stoele, speelgoedkiste en blompotte van herwinde material kan kry! Gee ‘n ou motorband ‘n tweede lewe, in die vorm van ‘n speelgoed kis. En dit is nie net plastiek en glas wat herwin word nie, ook hulpbronne soos water kan meer effektief benut word – soos met die handige 2-in-1 wasbaktoilet. SAFCEI het by die eko-kermis in Christchurch Constantia die bevindings van hierdie kerk se energie en water oudit ten toon gestel – hierdeur kan mens sien hoe klein intervensies en gedragsveranderings ‘n groot verskil in jou beursie en jou voetspoor op hierdie aarde kan maak. Hopelik steek die inisiatief van hierdie twee gemeentes ook ander geloofsgemeenskappe aan om groen-ekspo’s te hou, of selfs net hulle kermisse en basaars eko-vriendelik in te rig. By hierdie geleenthede vind mens bemoediging, sien mens dat om te sorg vir die aarde nie moeilik hoef te wees nie, en vind mens inspirasie om met dieper integriteit en groter harmonie ons lewens as deel van hierdie aarde te leef. For the second year, JAEI screened eco movies on a wintery Saturday evening, this time at St Francis of Assisi church in Parkview, Johannesburg. Since the eco-movies are a fundraiser for JAEI, our intern, Michelle, popped and bagged corn, and we shared wine, sparkling Oros (for the young and brave), and hot soup with rolls. We had home potted plants (mostly indigenous but that is a work-in-progress and a rather humbling exercise) on sale (see pic). First up was “Jane’s Journey”, the autobiographical story of Jane Goodall, primatologist and activist. Ms Goodall’s organisation Roots & Shoots is primarily aimed at young people and requires any projects to be concerned with each of people, animals and the land. Her compassion is riveting and inspiring, even as she ministers to folk who hunt her beloved chimpanzees for food! The second movie was “The 11th Hour“, a series of conversations on the urgency of our environmental plight linked together by Leonardo DiCaprio. Bart, one of our viewers, was so impressed by the arguments made in the movie that he advised it be ‘mandatory viewing’ for congregations. The video holds supplementary interviews, the ‘religious’ section of which interviews a rabbi, a priest, and an imam, with other faith traditions also represented in the movie. 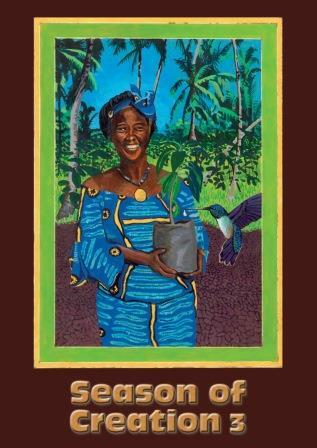 Faith was a linking asset in the fight for Mother Earth’s (and our own) life. We raised funds, modest though at R860 and as compared to last year, as our attendance was poor (was it the cold, or the French Open women’s tennis final?). Publicising is a ‘growth’ and a challenge area for us. We would welcome a skilled volunteer! We look forward to next year and the ongoing evolution of this event. 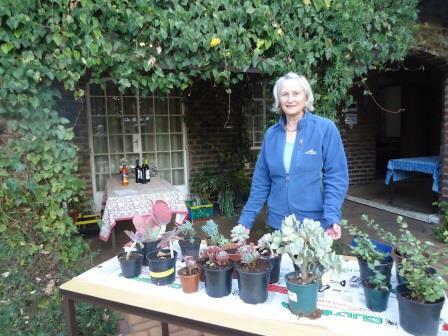 To celebrate Earth Hour 2014, St Mike’s, Weltevreden Park, held a “Star Watch” evening. A small band of enthousiasts joined for a picnic supper before our resident amateur astronomer, David Moore, wowed us with a presentation of unimaginable facts and figures regarding the what’s out in space and the mind-boggling distances – for example light travels 9.5trillion (yes trillion!) kilometres in one year ! So our nearest star (other than the Sun) – Proxima Centauri is a mere 38 trillion kilometres from us! 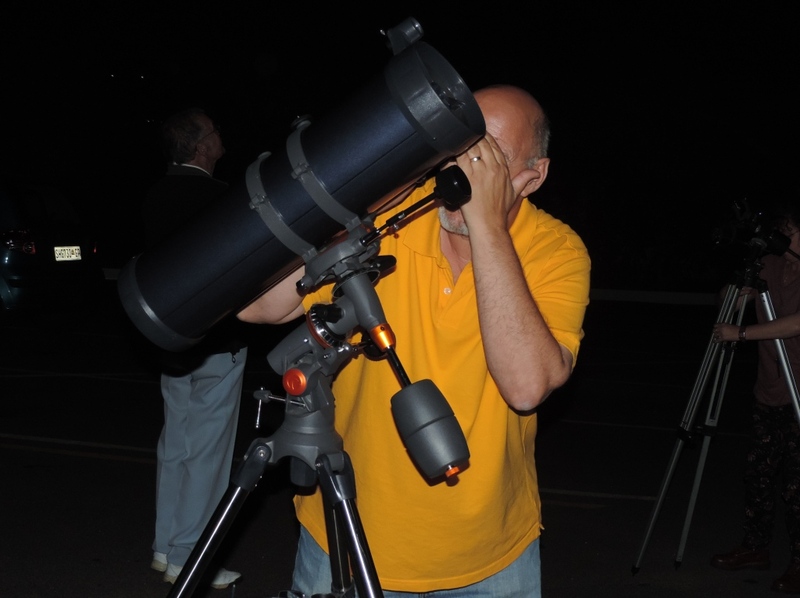 At the appointed hour, the lights were turned off and we were able to become enthralled all over again, this time by looking at the night sky through the telescopes that David had brought. Jupiter was very evident and we were able to see at least four of its moons. We were also amazed by the density of stars within the Constellation of Orion. Altogether – a fascinating evening! 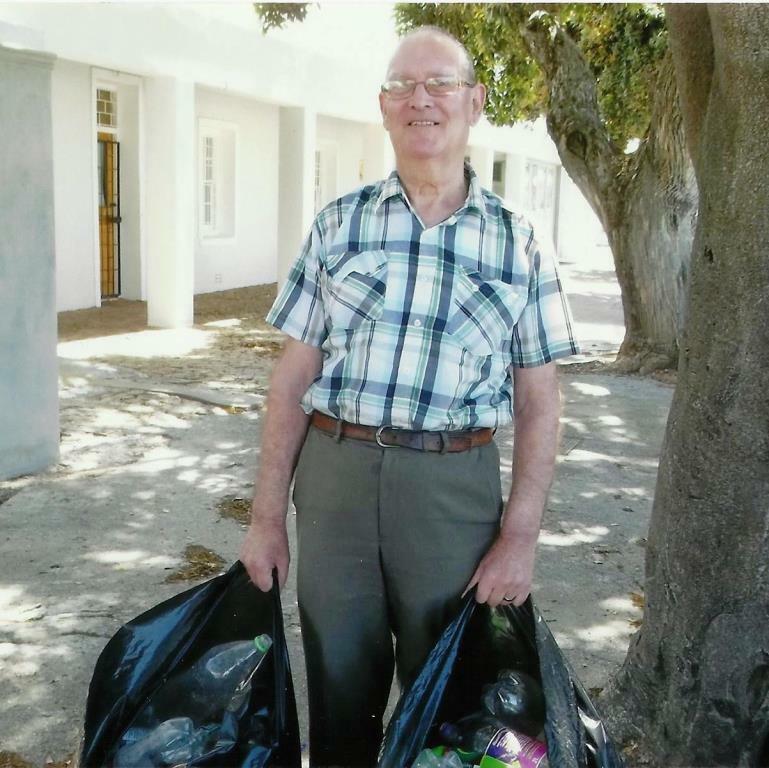 Wasteplan picked up 1015 kg of recyclable material, providing us with funds to finance our missionary in Limpopo Province. We collected paper, cardboard, tins and plastic bottles. Fortunately some of our church members host a farmers’ market every Friday, which contributes recyclable material to our project. After all, the whole process is just a good habit and it doesn’t cost a cent to those that give. Most importantly, a ton of so called rubbish did not end up in the sea or on a rubbish dump! I am sure God smiles down on us, seeing our little contribution to help maintain His creation. 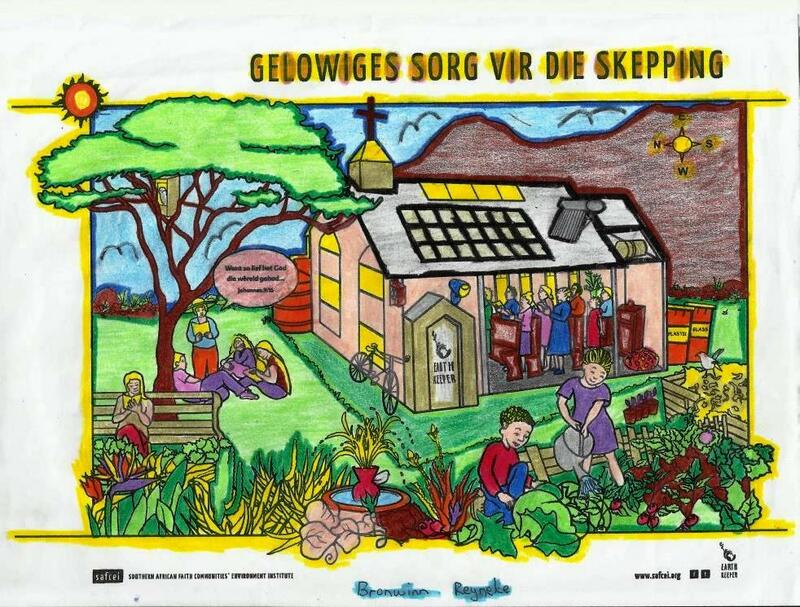 Eco-congregation, Die Strand Dutch Reformed Church in the Western Cape recently held a ‘colouring competition’ with the children. The picture was of one of SAFCEI’s posters “Churches caring for Creation” It was difficult to choose a winner, but in the end they all enjoyed it and were encouraged to colour-in the world around them. You can download your own free colouring-in poster under Tools. Organize a colouring-in competition with your church!